This is the third part in a four-part series on container runtimes. It's been a while since part 1, but in that post I gave an overview of container runtimes and discussed the differences between low-level and high-level runtimes. In part 2 I went into detail on low-level container runtimes and built a simple low-level runtime. High-level runtimes are higher up the stack than low-level runtimes. 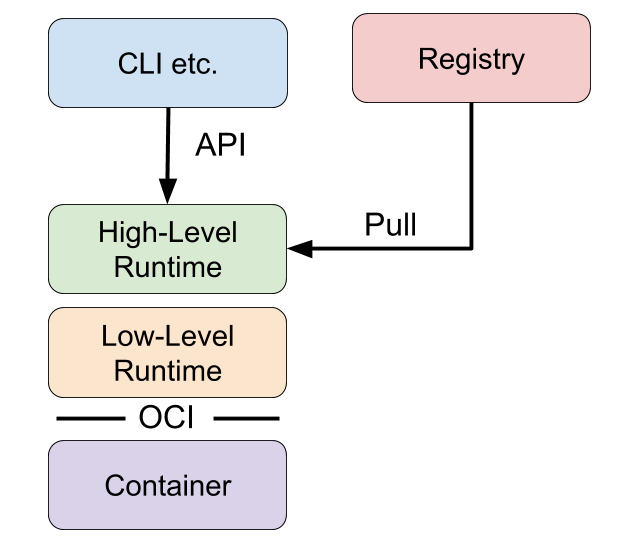 While low-level runtimes are responsible for the mechanics of actually running a container, high-level runtimes are responsible for transport and management of container images, unpacking the image, and passing off to the low-level runtime to run the container. Typically, high-level runtimes provide a daemon application and an API that remote applications can use to logically run containers and monitor them but they sit on top of and delegate to low-level runtimes or other high-level runtimes for the actual work. High-level runtimes can also provide features that sound low-level, but are used across individual containers on a machine. For example, one feature might be the management of network namespaces, and allowing containers to join another container's network namespace. To better understand high-level runtimes, it’s helpful to look at a few examples. Like low-level runtimes, each runtime implements different features. Docker is one of the first open source container runtimes. It was developed by the platform-as-a-service company dotCloud, and was used to run their users' web applications in containers. Docker is a container runtime that incorporates building, packaging, sharing, and running containers. Docker has a client/server architecture and was originally built as a monolithic daemon, dockerd, and the docker client application. The daemon provided most of the logic of building containers, managing the images, and running containers, along with an API. The command line client could be run to send commands and to get information from the daemon. It was the first popular runtime to incorporate all of the features needed during the lifecycle of building and running containers. Docker originally implemented both high-level and low-level runtime features, but those pieces have since been broken out into separate projects as runc and containerd. Docker now consists of the dockerd daemon, and the docker-containerd daemon along with docker-runc. docker-containerd and docker-runc are just Docker packaged versions of vanilla containerd and runc. dockerd provides features such as building images, and dockerd uses docker-containerd to provide features such as image management and running containers. 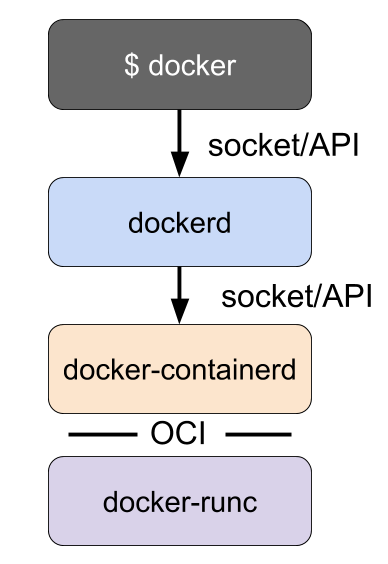 For instance, Docker's build step is actually just some logic that interprets a Dockerfile, runs the necessary commands in a container using containerd, and saves the resulting container file system as an image. containerd is a high-level runtime that was split off from Docker. Like runc, which was broken off as the low-level runtime piece, containerd was broken off as the high-level runtime piece of Docker. containerd implements downloading images, managing them, and running containers from images. When it needs to run a container it unpacks the image into an OCI runtime bundle and shells out to runc to run it. Containerd also provides an API and client application that can be used to interact with it. The containerd command line client is ctr. These commands are similar to how a user interacts with Docker. However, in contrast with Docker, containerd is focused solely on running containers, so it does not provide a mechanism for building containers. Docker was focused on end-user and developer use cases, whereas containerd is focused on operational use cases, such as running containers on servers. Tasks such as building container images are left to other tools. In the previous post, I mentioned that rkt is a runtime that has both low-level and high-level features. For instance, much like Docker, rkt allows you to build container images, fetch and manage container images in a local repository, and run them all from a single command. rkt stops short of Docker's functionality, however, in that it doesn't provide a long-running daemon and remote API. successfully removed aci for image: "sha512-2ba519594e4783330ae14e7691caabfb839b5f57c0384310a7ad5fa2966d85e3"
Though rkt doesn't seem to be actively developed very much anymore it is an interesting tool and an important part of the history of container technology. In the next post I'll move up the stack and talk about runtimes from the perspective of Kubernetes and how they work. Be sure to add my RSS feed or follow me on Twitter to get notified when the next blog post comes out. > Thanks to Craig Box, Marcus Johansson, Steve Perry, and Nicolas Lacasse for reviewing drafts of this post.